The health ministry says sh3b is needed to fight the deadly Ebola haemorrhagic fever. This includes the money needed to run the operations centre at the health ministry and to trace and care for all the reported cases and for local governments, the health ministry has said. Five ebola cases have been confirmed to date, three of whom are dead, the ministry said. However, 13 other people connected with these in Kibaale died and were buried before their samples could be collected. Health minister Christine Ondoa told journalists Friday that 32 cases were being investigated, while 312 others, who had contacts with the suspects were being monitored. She said an inter-ministerial task force, as well as the national task force on Ebola, had been formed, the latter headed by the health ministry. Ondoa said the ministry was also working with the World Health Organisation (WHO), the Centre for Diseases Control, Medicine San Frontiers, Uganda Red Cross and others, to contain the outbreak. She said those suspected were in isolation centres, including health workers. The ministry, she added, had sent an ambulance to Kibaale to collect the sick and an equipped vehicle to help bury the dead. WHO representative Dr. Joaquim Saweka, ministers Ephraim Kamuntu, Mary Karooro Okurut and Asuman Kiyingi also addressed the press. They expressed dismay that some people were exaggerating the Ebola issue to scare others away, yet the WHO says there is no need for travel restrictions. 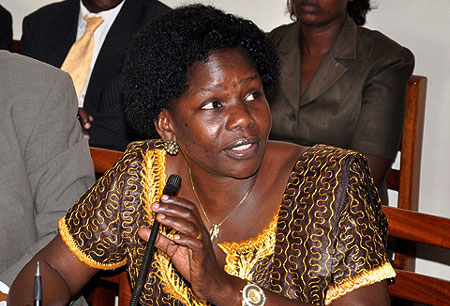 The Mbarara and Makerere suspected cases were false, Ondoa said.